Planners drawing of the future Marincello, mid-1960s. Gerbode Valley in 2014, viewing across its eastern highlands towards the Golden Gate. 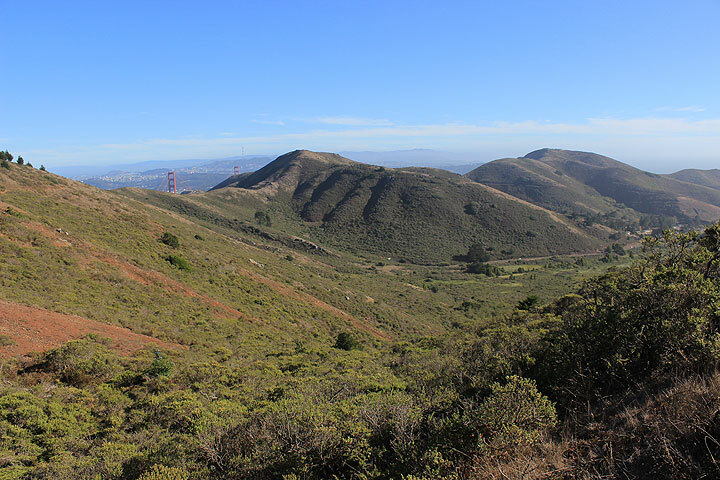 View into Gerbode Valley, proposed site for Marincello, seen here in 2010, decades after its incorporation into the Golden Gate National Recreation Area. 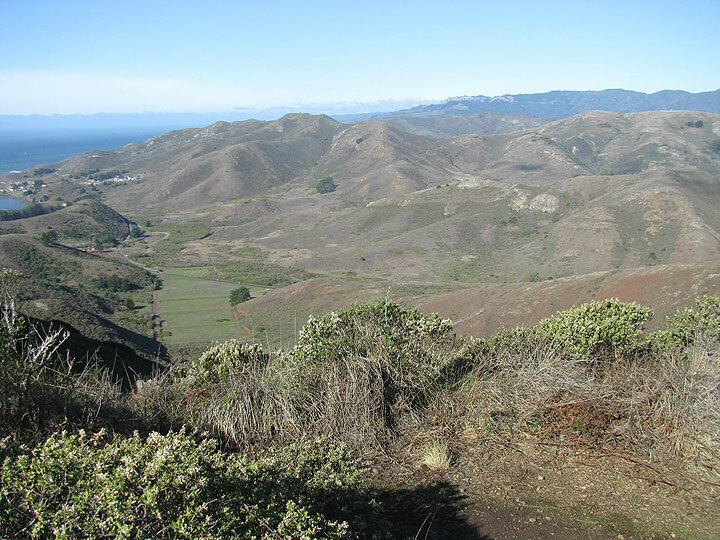 View west through Gerbode Valley to Muir Beach, 2014. 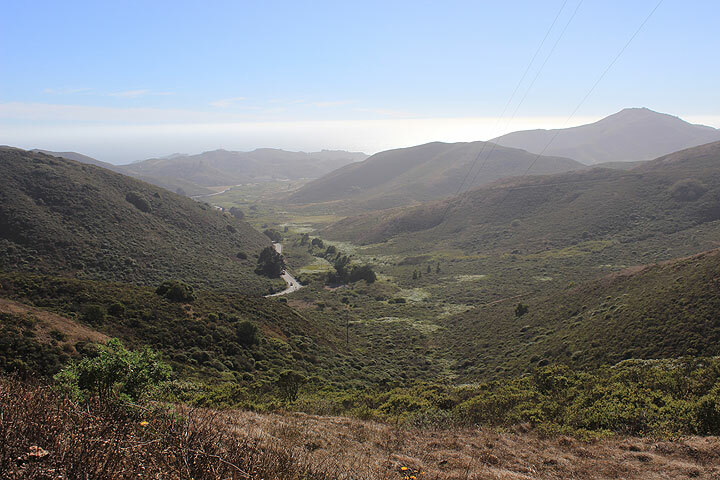 Conceived in the early 1960s by the developer Thomas Frouge with the financial backing of Gulf Oil Corporation, Marincello was planned as a bedroom community for San Franciscans in the picturesque interior landscape of the Marin Headlands. This suburban community originally on 2,000 acres was designed to house over 150,000 people in homes, townhouses, and high-rise apartment towers. Future residents would have shopped at a sprawling mall and their guests would have stayed in a lavish hotel. That vision was tempered through the planning process and developed into a scheme for a new town of 30,000 residing in towers and low-rise housing. Intended to represent "open-space" architecture, built structures were clustered in the landscape with minimal roadway access. The leading concept for the project integrated cultural amenities with commerce in buildings for theater, music, cinema, dance, decorative, fine and literary arts, a lyceum, and an artists' embassy terminating at the circular, paved Brotherhood Plaza. 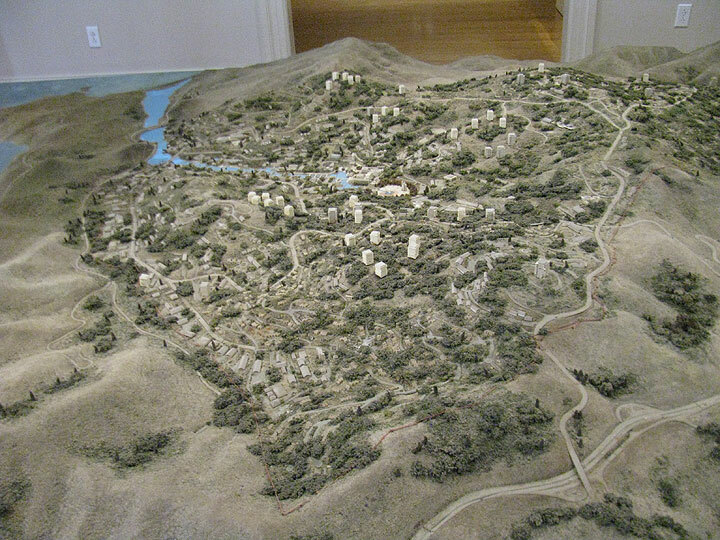 Architectural model of later Marincello plan, still proposed to house 30,000 people in this version. 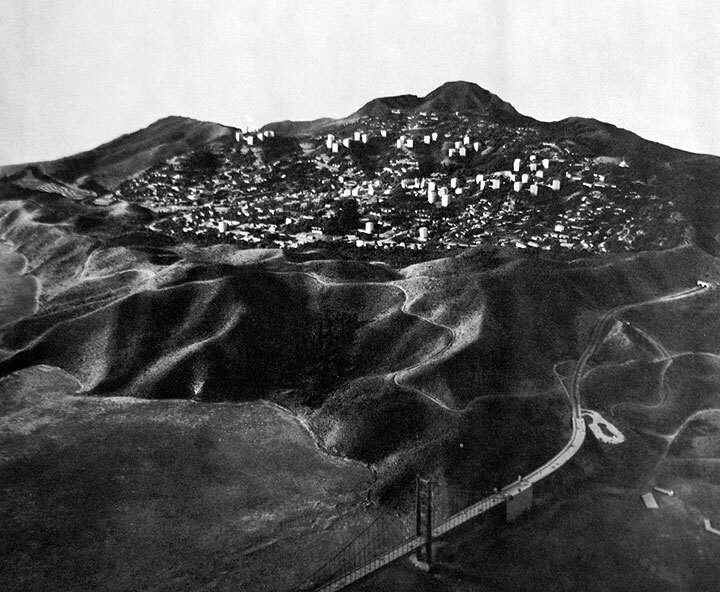 Obstacles to construction began almost immediately following the plan's 1965 approval by the County of Marin. 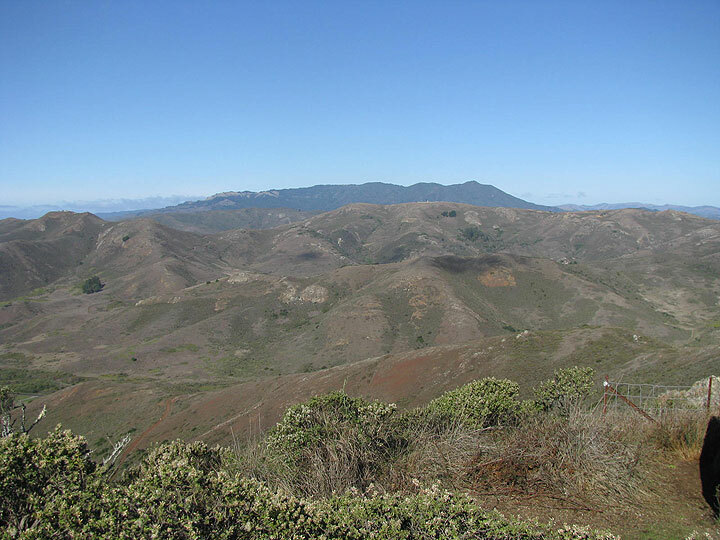 Homeowners' accusations of trespassing, a ballooning budget, legal disagreements between Frouge and Gulf Oil, a successful lawsuit claiming zoning irregularities, and sale of the lands to the Nature Conservancy in 1972 for the newly established Golden Gate National Recreation Area all led to Marincello's demise. By 1976, the would-be community's entry gates--the only architectural evidence of the failed project--were demolished. Gerbode Valley with Mount Tamalpais in distance, looking north from Conzelman Road.